OK... back in the saddle. Promptly thrown off. Repeat. A lot. Robert the Bruce would be impressed. Actually had a pretty good summer holiday. It was just the rest that sucked. When you are pretty much on your own juggling plates like those acts on the Generation Game, pretty soon the place is going to look like the aftermath of a Greek wedding. Stuff doesn't go away when you take a break; it compounds. There were thus two options. ............ and, then, start over again. 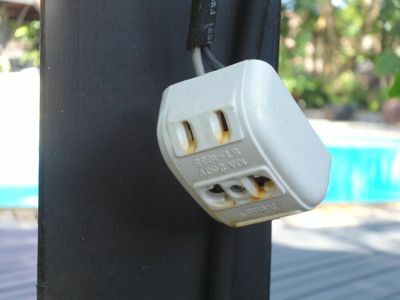 Like that awesome bit of wiring in the picture (taken from the poolside of our holiday hotel), it's not exactly broke, but could probably use fixing (water-created rust streaks from a live socket!). So you are looking at the first shot in a root and branch re-jig of everything. Not just Junkk.com (which will, by virtue of being steam-driven, remain the same as almost nothing cannot be changed now the last Benedictine Monk who programmed it has given up his vows to hit Vegas), but all around that it feeds and feed it. Blogs, tweets, FaceBooks, YouTubes, newsletters, etc. Including other blogs such as Firebird.com (already 'holding', but showing a hint of our plans with automated tweets ported in from another location), RE:tie.co.uk & even phoenixj.com (our design, music & A/V director), all of which do have some kind of relationship with the Junkk.com content and its management. The aim will... is... hoped to be to incorporate more that is automated and updated from other sources, such that 'stuff' will be seen to 'happen' a lot more than it is currently. Sadly some things will still lie fallow and slumber on a while longer (such as the Forum:(, as the aforementioned steam-driven system is now over a decade old, and what can be done in a trice, for free, with some nifty script, on Junkk.com takes an age just to program on an admin system that cost an arm and a leg. And that's in a time when body parts were worth something. With luck you won't notice too much. Maybe a holding page here (if we're lucky), or an error message there (if we're not). All we ask is your patience and indulgence. With luck, and a following wind, it will all be worth it. And all right on the night.